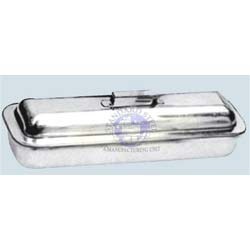 We are a leading Exporter of instrument trays, kidney tray, dressing drums and catheter trays from Ambala, India. We have expertise in manufacturing a wide range of Instrument Trays in various sizes. The trays are manufactured using quality stainless steel to ensure durability and corrosion resistance. Fine in finish, the trays are in conformation with the international quality standards. We offer these trays with cover and pack these using quality material. Accurate in design, our range of Kidney Trays is fine in finish and long lasting. 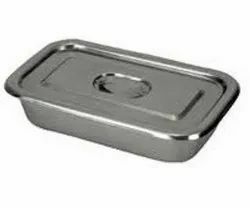 Manufactured employing latest technologies and stainless steel, the trays are corrosion resistant and durable. Light in weight, these are in accordance with the international quality standards. Priced reasonably, the trays are used in a number of hospitals. We offer our trays in various sizes including 6”, 8”, 10” and 12”. We put forth our clients an extensive range of Dressing Drums that are durable and finely finished. Resistant to corrosion, the drums comply with the high quality standards. Light in weight, the drums are easy to carry, and make the work of nurses and doctors simpler. 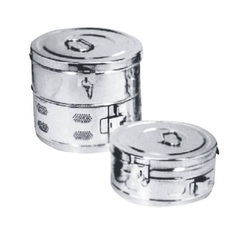 We offer these drums at affordable prices and use sturdy wooden boxes for packaging. Our clients can avail from us high quality Catheter Trays that are excellent in finish. The trays are durable, light in weight and conform to the international quality standards Reasonably priced, these are highly demanded due to their corrosion resistance. We make certain to pack the trays in heavy duty car boxes to avoid any damage during delivery.